This new ebook was written in collaboration with nine other pro-outdoor photographers with one goal in mind: To help elevate the emotional power of your images – regardless of what equipment or software you currently own and use. Together, we discuss some of our creative insights and processes which you can use and apply to your own photography to consistently create more powerfiul and evocative images. These are definitely not the typical basic tips you commonly find on the web. Rather, these are intended to be little-known high level insights gleaned from decades of combined in-the-field experience. They are the creative thought processes of the photographer. The intention here is simple: No fluff. No theory. Just insights that will help pack your photos with punch. Each insight is accompanied by an example photograph as well as a video exploring the creative process behind that image in much greater depth. 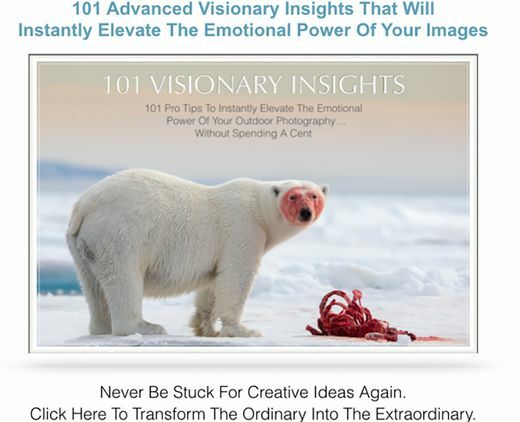 I am excited to share this new creative resource and hope you find it of benefit in your photography. If you want to learn even more there are optional expanded videos also available for download.